The Union Minister for Science & Technology, Earth Sciences and Environment, Forest & Climate Change, Dr. Harsh Vardhan at the signing ceremony of Accreditation Master Agreement between NABARD and GCF, in New Delhi on July 27, 2017. New Delhi: Union Minister of Environment, Forest and Climate Change, Dr. Harsh Vardhan has said that India is committed to the cause of Climate Change. Delivering the keynote address on the occasion of the signing of Accreditation Master Agreement (AMA) between Green Climate Fund (GCF) and National Bank for Agriculture and Rural Development (NABARD) here today, the Minister said that India has been leading from the front in tackling global climate change issues and it will continue to do so in the future as well. “India, like other developing countries, can do more, if finance and technology development & transfer and capacity building support are ensured as per the convention and its Paris Agreement”, Dr. Harsh Vardhan said. The Minister emphasised that climate justice demands that we remain mindful of the needs and aspirations of the poor. 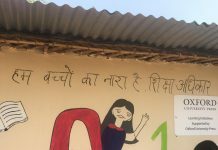 He pointed out that despite being one of the fastest growing economies of the world, India has a significant percentage of population living below the poverty line. “We need to take cognizance of the population size and income inequality and cannot ignore the basic requirement of electricity, housing and food for the poor. We expect GCF to partner with us on these issues and prioritize their work to overcome these challenges,” Dr Harsh Vardhan said. He highlighted that India is creating a network of strong institutions that can act as enablers for scaling-up climate action through technologically sound and innovative projects. Dr. Harsh Vardhan stated that environmental consciousness is the bedrock of our growth aspirations. “We are fully conscious of the need to pursue an ecologically sustainable development pathway. Our Prime Minister Modiji wants to build a new India by 2022 – riding on the demographic dividend and opportunities to use off beat solutions like solar and wind power, smart cities, incentivizing forestry, creating investment openings and overall, involving all in the development process”, the Minister said. Speaking on the occasion, Executive Director of GCF, Amb. Howard Bamsey said that India has been acknowledged as a strong proponent of climate change action and GCF looks forward to greater engagement with India. Several of the mitigation and adaptation targets, articulated in India’s Nationally Determined Contribution (NDC), to meet the international climate obligations are aligned with the Fund’s strategic impact areas – viz clean energy, energy efficiency, cities, transport, forestry, agriculture, water health and ecosystems. India’s NDC is among the few that make specific reference to the GCF specifically with regard to its role as a source for low-cost finance for its 40% non-fossil fuel based power target. India, with numerous climate change and developmental challenges, needs to engage more purposefully and actively with GCF. The accredited entities need to proactively engage with GCF to take advantage of the available opportunities. The Green Climate Fund (GCF) is one of the operating entities under financial mechanism set up under the United Nations Framework Convention on Climate Change (UNFCCC) to provide support to developing countries in combating climate change, with resources to be generated from funding by developed country Parties and various other public and private sources. It supports both climate change adaptation and mitigation projects in developing countries. So far, one project from India on “Installation of Ground Water Recharge System” in Odisha has recently been approved by the GCF for $34 million. Another proposal on coastal areas has already been submitted to the GCF Secretariat and several more projects are in the pipeline. India has nominated a total of five direct access entities for accreditation by the GCF. Two of these from the public sector and three from the private sector for accreditation by the GCF. The public sector entities are NABARD and Small Industries Development Bank of India (SIDBI). The private sector entities nominated are YES Bank, IDFC Bank and IL&FS Environmental Services. So far, NABARD and SIDBI have been accredited by the GCF. NABARD is the first entity from India to be accredited as Direct Access Entity (DAE). The signing of AMA between GCF and NABARD is an essential first step for accessing the GCF resources to help safeguard the lives, property and livelihoods of millions of people against climate change impact. 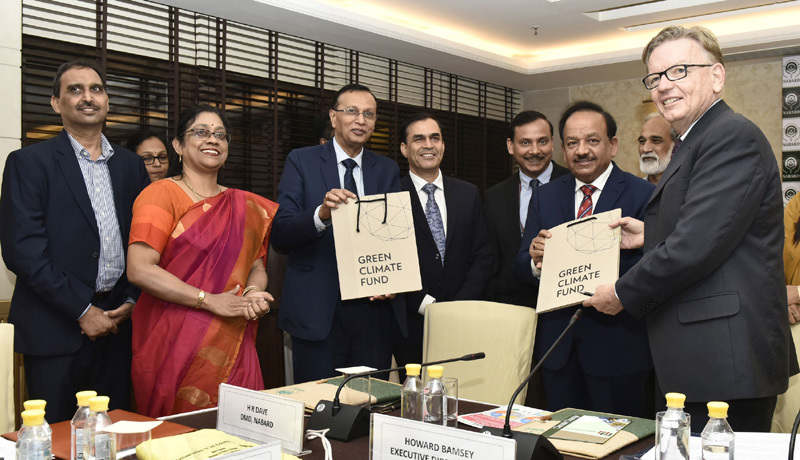 Board Member of GCF from India, Shri Dinesh Sharma, stressed upon submission of large size of proposals or multi state proposals from India to access the GCF resources and said that in coming years, GCF may play an important role in supporting climate change projects.